The Manticore, a mythological Greek beast was a fearsome sight, with the body of a lion, and the mane to match, the Manticore had a humanoid head, which was teamed with the tail from the deadly scorpion. A striking sight the Manticore was even more fearsome when viewed from up-close, with a row of sharp pointed teeth that could strike fear into the most brave warrior. The Manticore was incredibly deadly and dangerous due to a number of factors, the Manticore had the speed and agility from its lions body, enabling the Manticore to reach speeds that a mere mortal would be unable to compete with in a chase. It also possessed the powerful legs and claws of the lion, meaning up close it would be able to tear through flesh with ease. The Manticore also had the intimidating and deadly scorpion tale, which was additionally laced with barbs, allowing the Manticore to fire projectile spikes at it’s opponents. If the Manticore’s projectiles were to strike flesh, they would inflict poison and rendering anyone they struck useless and powerless. 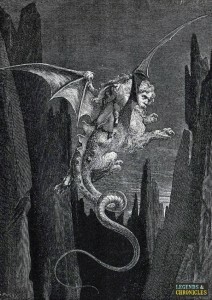 With its humanoid head, the Manticore was able to make noises and sounds, but due to all accounts, was unable to speak. Instead the Manticore would make musical sounds, which was a tell if you were concerned there was a Manticore in the near vicinity. If you were to encounter a Manticore, there may be nothing left to examine if you were to be struck by its sting. The Manticore was known to devour its prey whole, and no trace of their existence was left behind. Clothes, money, belongings and shoes would be devoured with ease by the powerful and fast Manticore. 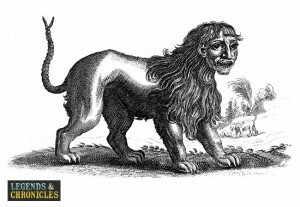 Long rumoured to be wild in India, the Manticore was never though to exist in Europe or America, although it has been rumoured to have been seen in Greece. The Manticore was reported to have prowled the jungles of India, hunting its prey and scaring the natives. The Manticore was one of the Greek Mythological creators has its origins in Persia, where the Manticore was referred to as the ‘man eater’ or its Persian name Martyaxwar. Later the Manticore would receive more notoriety thanks to a Greek writer, Flavius Philostratus, who recorded a conversation alluding to the existence of the mythical Manticore. “As the hunters gathered round in the dusty night, they wondered whether hunting the fabled Manticore was a wise idea. It didn’t matter now, the decision had been made, and no musical sounds had been heard yet. However as the hunters settled in their camp, they heard some muffled whistling, with their weapons ready, the hunters felt their heartbeat rise, was this the legendary Manticore or just a trick of the wind. Only one hunter made it back, he never saw the Manticore with his own eyes, but his colleagues fell one by one, until he could stand firm no longer.